Internet seems to be working now. Here goes! For those who read my sister's blog, here's the Leprechaun trap that she was talking about. This was St. Patrick's Day of 2007. 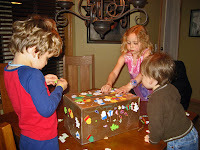 The kids decorated the box then we propped it up with a stick and put some bait out before bed. When the kids awoke the trap was down and goodies were left behind, but to no avail the leprechaun escaped. St. Patrick's Day's have gotten a little less boring since then. Our leprechaun leaves green orange juice in the fridge for Vance. And he's perfectly content with that. Here's the kids in full regalia. Vaughn kept the braids on for about 3 seconds. We rounded the night out with Mexican food. Hey, the guacamole was green! We need to make a trap next year and then just save it so we're always ready!! !